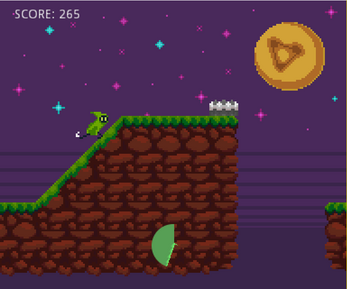 Infinite runner where you have to keep jumping! Made by myself, Idle, and DipsyDip for the 18th Weekly Game Jam! Art by Idle, soundtrack by DipsyDip, programming by me. Game design was iterated on by all of us, throughout the project. If you don't jump for a certain amount of time, you die. But when you jump, your score goes down. The goal of the game is to keep your score high by jumping conservatively to avoid obstacles. Up/W to jump, Enter to start the game, R to restart when you die.